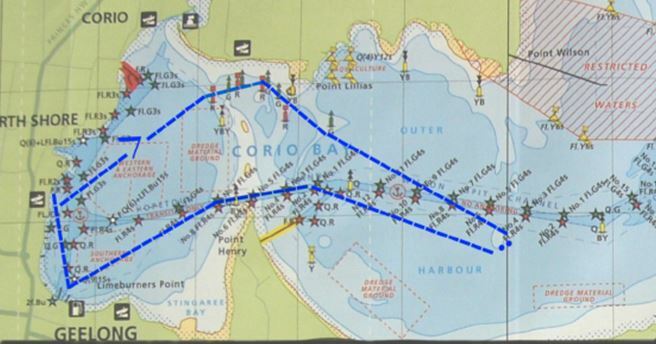 The Cluster Cup is a Passage Race starting from St. Helens, Proceeding via the North Channel to Corio Bay Outer Harbour, thence to “the Cluster” near Drysdale and returning to St Helens via Hopetoun channel and Geelong City. “The Cluster”, historically, was the three-legged platform warning shipping of a shallow spot near Drysdale. The Cluster has, in recent times been replaced by a Cardinal Mark. Course above for illustration purposes only. Please refer to Sailing Instructions for correct race course.